Photbattle Extension for Joomla - May the best picture win! Photobattle Extension for Joomla provides an easy image voting system, requiring only a single click for a speedy process. You can test Photobattle by clicking the menu on the left, and check out the administrative backend by clicking on the menu on top. The component can be used to rate different images and to rank them to each other - like landscapes, art, etc. or if the gender mode is enabled, it will allow separate categories for male and female images. The image upload is very simple, allowing also multiple uploads. For each picture a sharelink and the number of hits will be visible and if admin enabled the description, comments and tags. To allow the administrator content control on the site, each picture and comment can be reported as illegal/offensive. 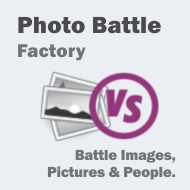 Users can upload their images into the system either as a picture for a Random Photobattle or as a pair of pictures that they'd like to have compared. This way you can have two types of battles - Random or Prepared. Admins can enable guest voting allowing unregistered users to quickly cast their vote, or can disable this feature and allowing the photos to be voted only by the registered community.